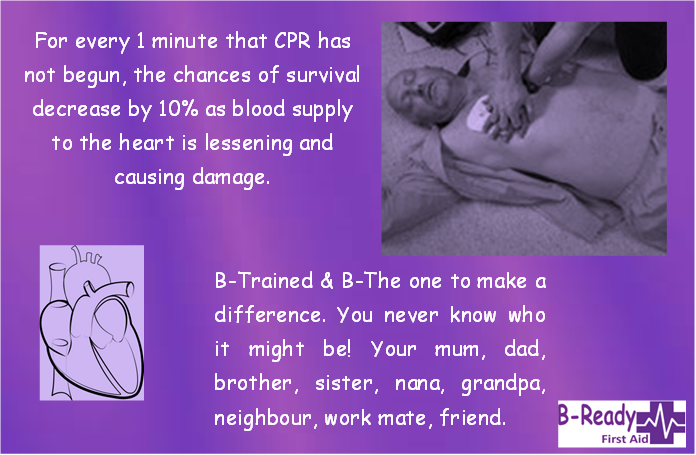 B-The one to make a difference learn CPR, First Aid, Asthma & Anaphylaxis Management with B-Ready First Aid in Brisbane, 3 Locations Camira/Springfield, Woolloongabba & Gatton. For every 1 minute there is no blood circulating through the heart 10% of the muscle will die. 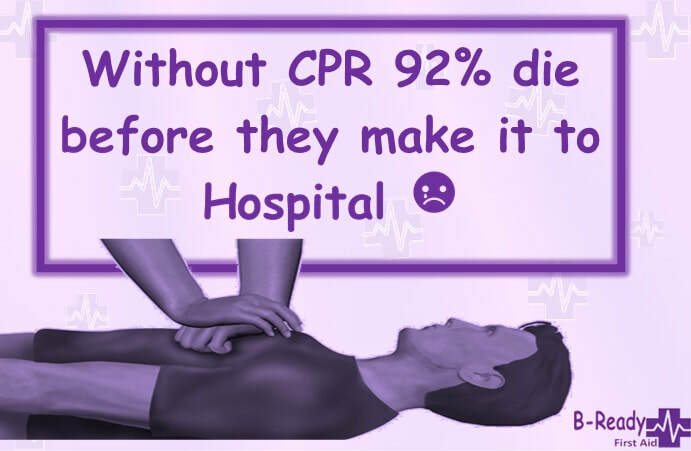 ☹️ Without CPR Oxygen is not circulating and we will die. 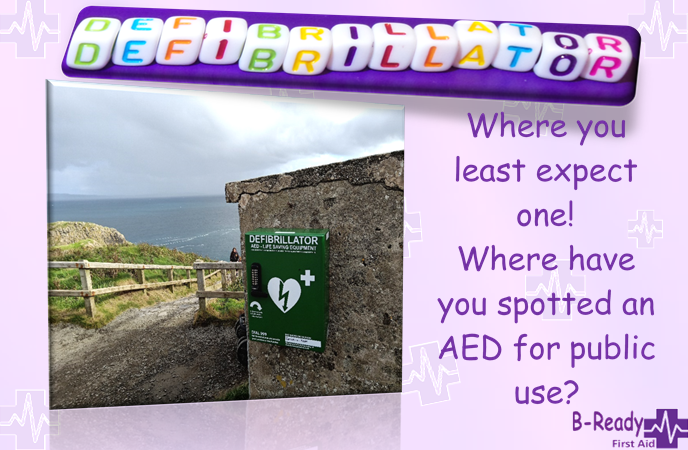 Strategically placed AED don't you think?? Keep your eye's on the lookout! 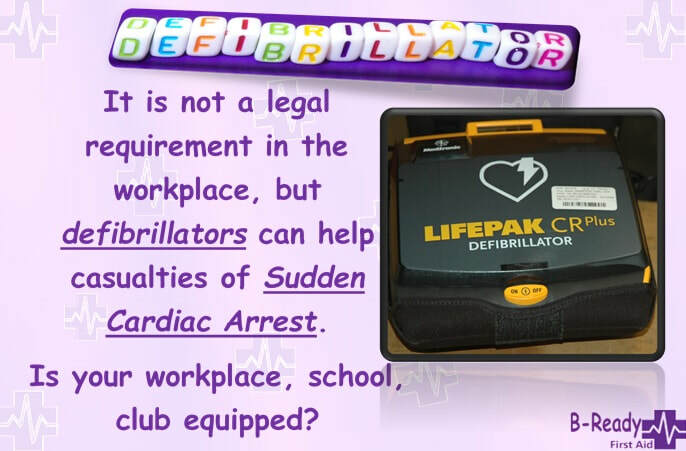 Knowing where the nearest Defibrillator is located when at home, work or out and about could be the difference between life & death. Do you have access to a barrier device to perform rescue breaths? 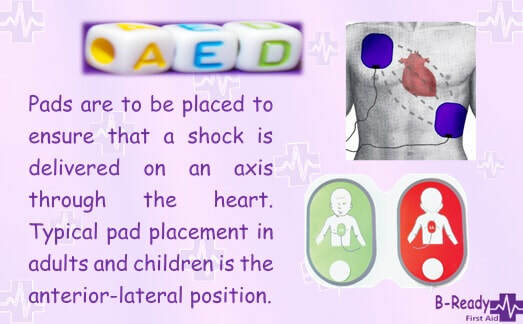 It is a reasonable & sometimes essential aspect during CPR! 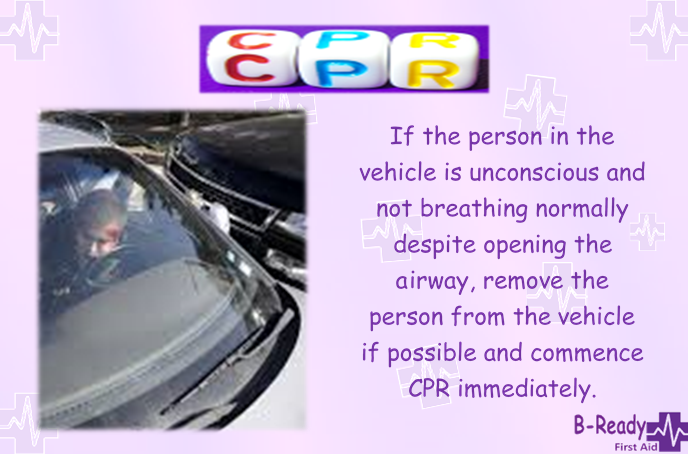 The purpose of CPR is to temporarily maintain a circulation sufficient to preserve brain function until specialised treatment is available. 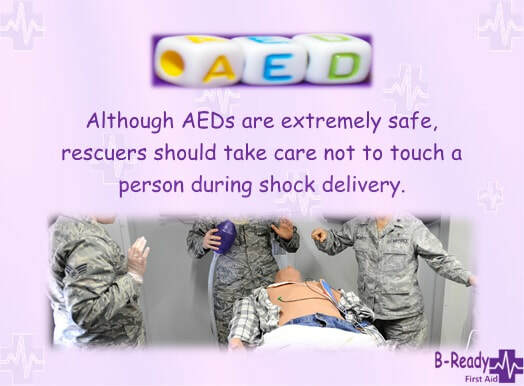 The importance of defibrillation has been well established as part of overall resuscitation, along with effective cardiopulmonary resuscitation (CPR). Here is a little more info on the placement of the pads! 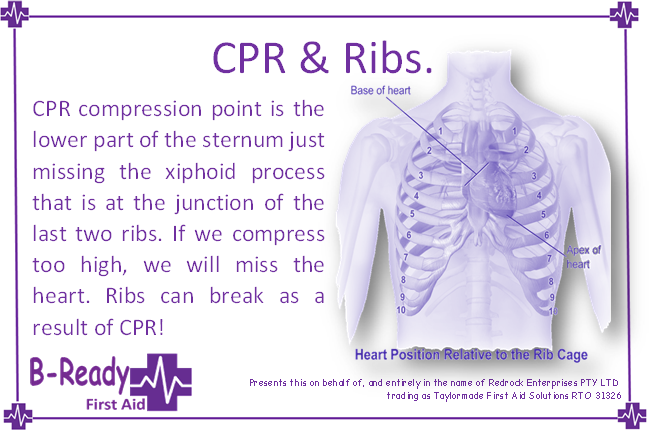 Yes ribs can break as a result of performing CPR even if correctly done. 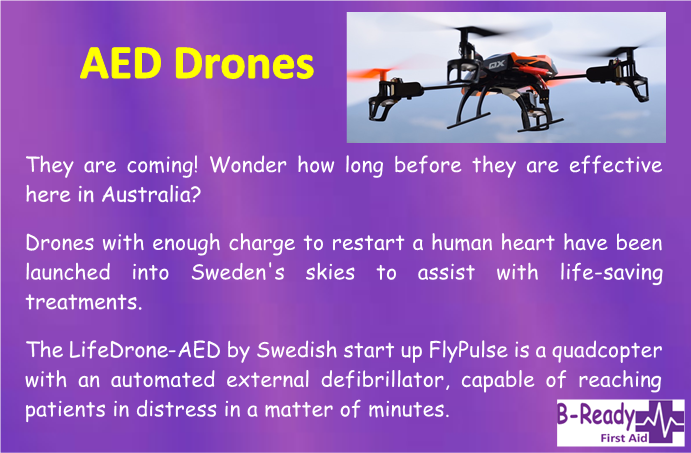 They are limited in the distance they can travel at the moment but I wonder how long it will take for these to become much more effective in Australia. This is pretty amazing but does not replace the initial CPR by a bystander. Two hand for adult CPR, 30 compression's (100-120 per min) & 2 breaths if possible. Any Attempt is better than none! CPR for a child aged approx 1-8 years of age we would use one hand, possibly with support, as seen here. 30 compression's -2 breaths (if possible) @ a rate of approx 100-120 compression's per minute. How to give Infant CPR, use a firm surface underneath the child, press with two fingers or your thumbs on the lower part of the sternum. 30 compression's and followed by two little puffs without tilting their head back. Keep going until there are signs of normal breathing returning or until help arrives. What are your thoughts on this? 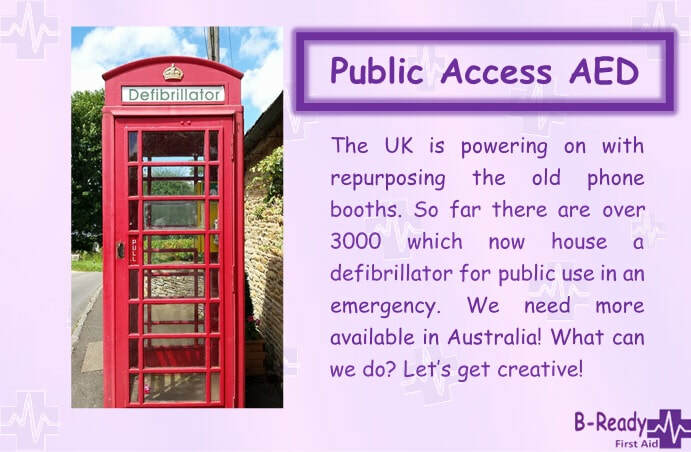 Interesting idea! The Gift of LIFE. 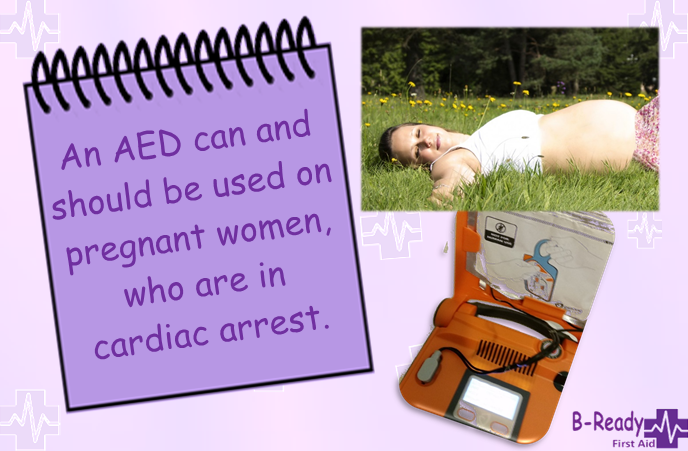 The importance of learning CPR & how to operate an AED increases the chances of life considerably. Is it time for fundraising? Check this out! 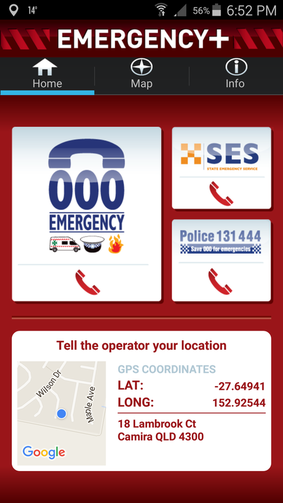 I have a close friend that has forgotten this number in an emergency! Do you know anyone that has forgotten our triple zero number or maybe it was you?? 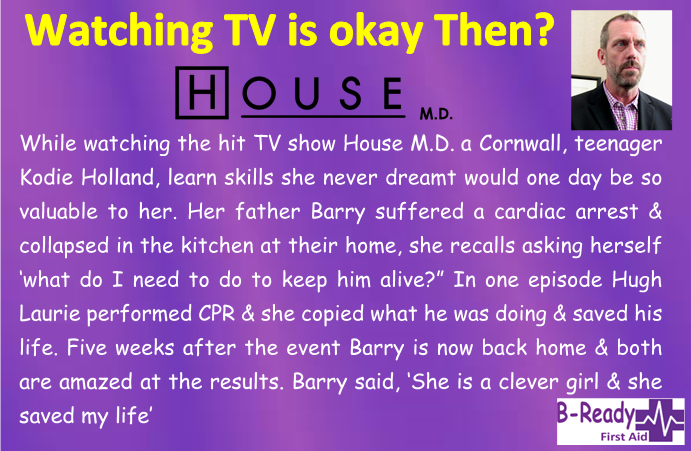 Here is a positive for watching TV, but I'm not sure all are equally valuable? There are so many people that have made such a difference and these two certainly have! CPR History short video's and information! 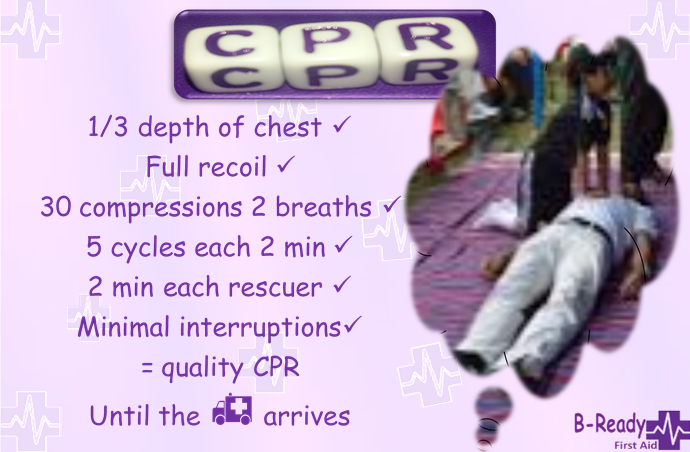 ​Check out the early days & beginnings of CPR! Some interesting event have happened to get to where we are today! This is the third in the series of how CPR has progressed and this is the more recent years that some of you may relate to if you have been taking your First Aid courses. Many changes happen and improve outcomes for many people. Amazing how things have been learnt over the years. Here is some interesting progress, that I'm grateful of. 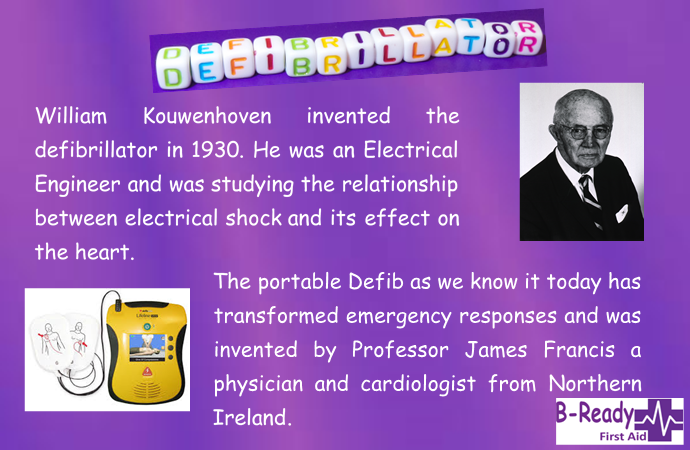 ​Last in the series of how CPR has changed over the recent history including the use of the Defibrillator and the change of 30 compression's and 2 breaths for all casualties. 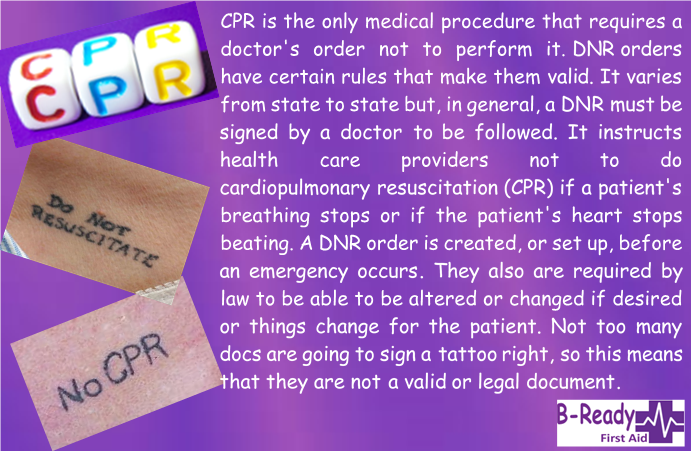 We often get asked about these types of Tattoo's, so here is some information. 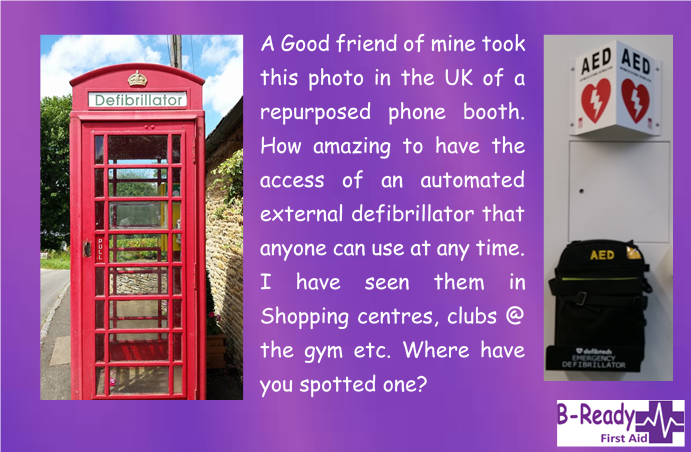 However unless you are using a defibrillator or they were swimming we generally would not remove clothing to notice. Have you ever completed a CPR course? You could be the one to make a difference in someones life! 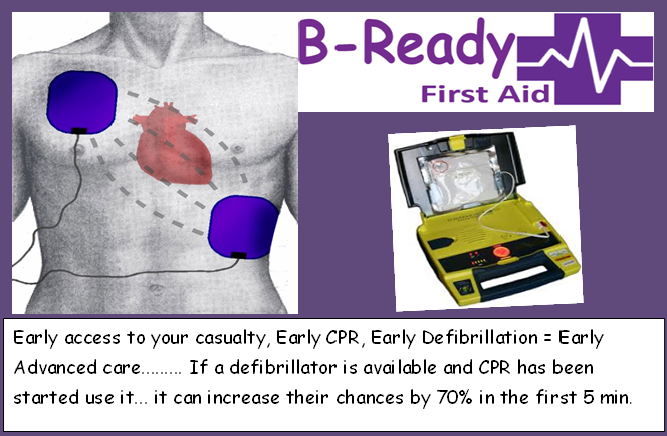 Learn what to do, how to do it with B-Ready First Aid! Hopefully this is a rarity, but if needed very important if possible. 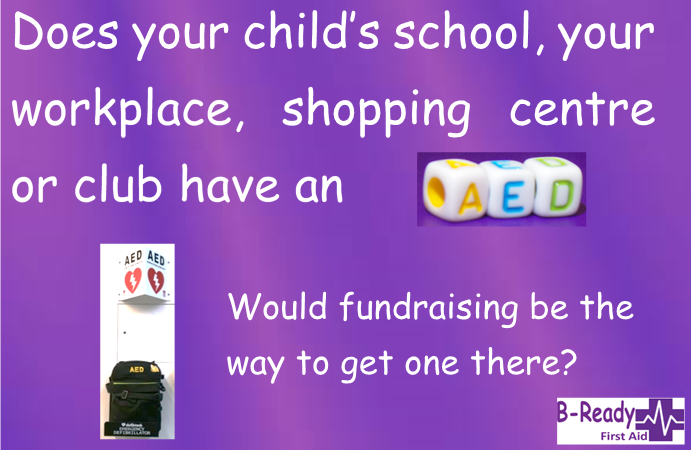 B-The one to make a difference learn First aid & B-Ready today! There are a few apps around that can make a game out of learning this for kids, browse your app store and see which would B-Best & B-Ready in an emergency! 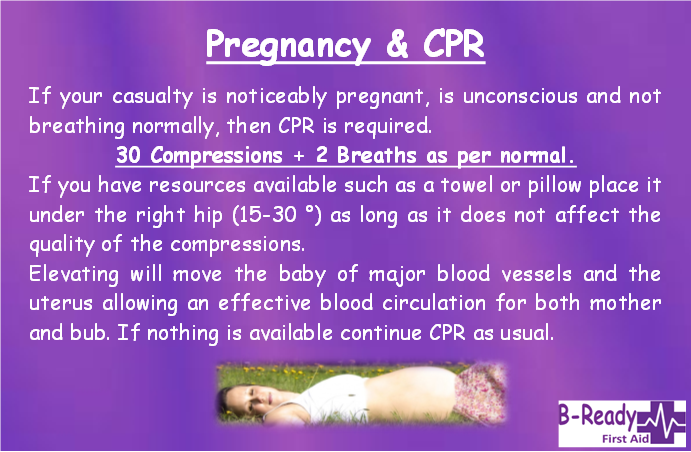 CPR is best with 100-120 beats per minutes, this is the ideal rate, pressing down approx 1/3 the depth of their chest on the lower half of the sternum. Not too low or they might vomit or regurgitate. Yes you can break ribs or even have other injuries but this is deemed reasonable consequences! 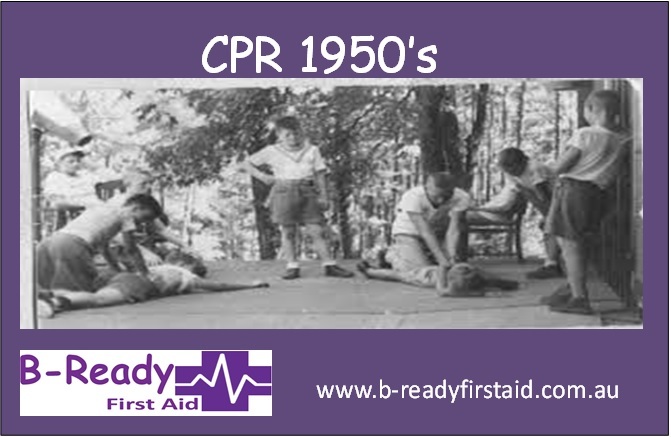 B-Ready First Aid... A glimpse into the past history of CPR and some amazing discoveries over the years... 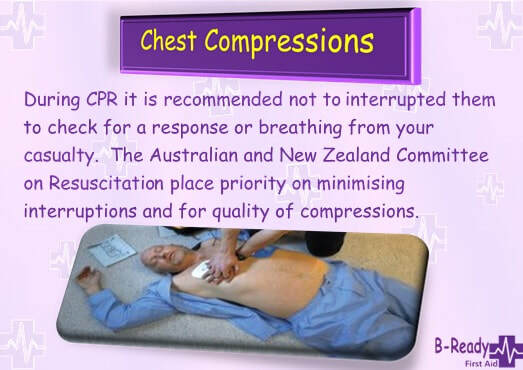 In Australia we also include two breaths with the 30 compression's unlike America and other countries that have hands only CPR! 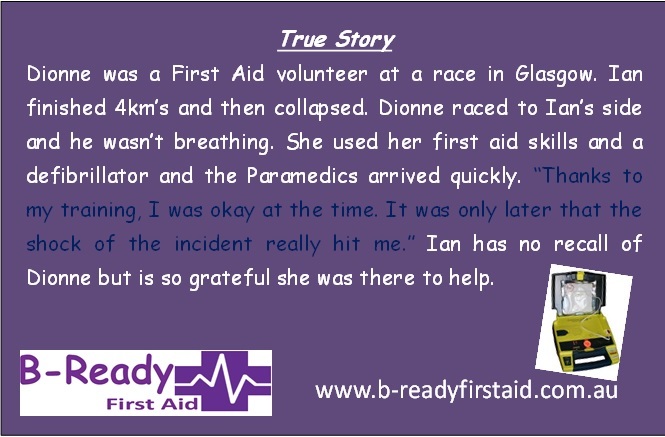 B-Ready learn CPR Way to go Scotland, Same same all around the world! 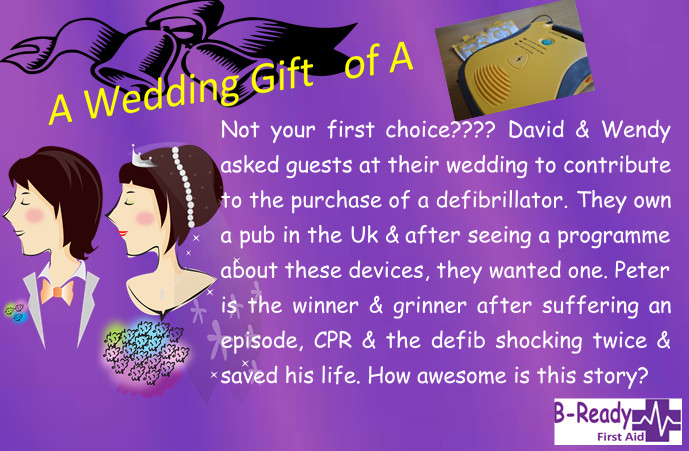 Great CPR and Defibrillator true story! Ever wondered about the CPR Manikin face? A little of CPR history of techniques, shaping things to come! Worth the time! B-Ready to make a difference, B-Trained in CPR and First Aid Today. 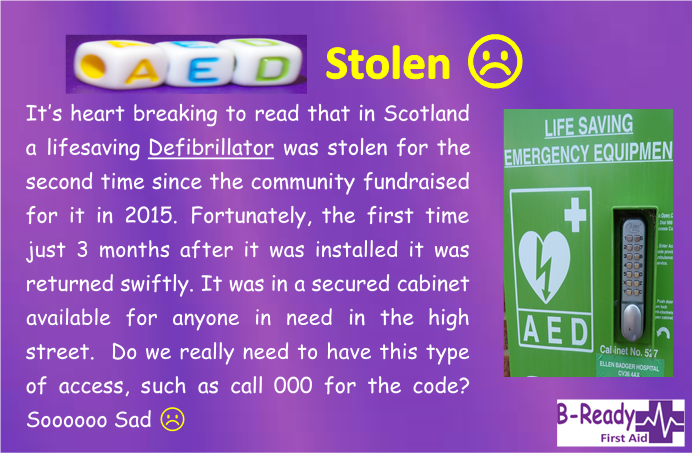 Below is part one and two of an amazing rescue from years ago, Please be advised that part one could be confronting especially to those who have never seen real CPR with Defibrillation and in a Drowning setting.